Attractive chevron surface pattern brushes dirt and moisture from shoes. 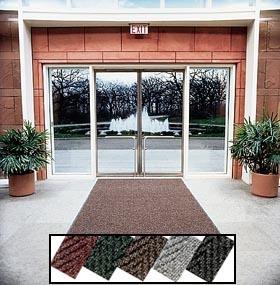 "Chevron Ribbed" design offers aggressive, multi-directional scrubbing action. 38 ounces of polypropylene fibers per square yard improves performance by as much as 28%. 80 mil of PVC backing assures edges won't ripple, crack or curl. 3/8" thick. Passes Flammability Tests DOC-FF-1-70 and DOC-FF-2-70. Available in Charcoal(BL), Autumn Brown (AB), Gray (GR), Burgundy (BD), Wine (WI) and Hunter Green (GN) -- please specify. FOB Shipping Point. Product No. Size W x L Thickness Wt. (lbs.) Price Ea. Product No. Size W x L Thickness Wt. (lbs.) Price Per Lin. Ft.
H118C0036 36" x Length (Order by Lin. Ft.)	 3/8"	 .94/sq. ft.
H118C0048 48" x Length (Order by Lin. Ft.)	 3/8"	 .94/sq. ft.